U.S. Secretary of State Mike Pompeo arrives at Osan Air Base in Pyeongtaek, in South Korea, Oct. 7, 2018, after his North Korea trip. Arriving in Seoul on Monday after his meeting in Pyongyang, Pompeo said "significant progress" was made in his talks with Kim and that they were "pretty close" to agreeing on the details of the second summit. Pompeo also said Kim agreed to open North Korea's Punggye-ri nuclear test site and Sohae missile engine site to international inspectors. 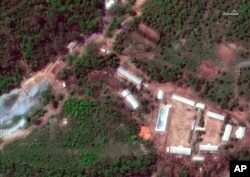 FILE - This Wednesday, May 23, 2018 satellite file image provided by DigitalGlobe, shows the Punggye-ri test site in North Korea. Evans Revere, a former State Department official who negotiated with North Korea and is now a nonresident senior fellow at the Brookings Institution, a U.S. research group, said, "I've looked hard for any signs that significant progress was made on denuclearization, but have found none." Ken Gause, director of the International Affairs Group at the Center for Naval Analyses, a research and development center serving the Navy and other U.S. defense agencies, also doubted that any meaningful steps were taken during Pompeo's latest meeting with Kim. "I was kind of surprised that he said that there has been significant progress because nobody seems to have any information that suggests something significant took place," said Gause. 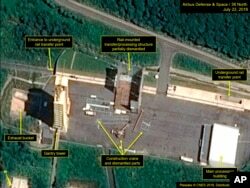 Revere said North Korea managed to use its test sites as a "trading bait" to gain concessions from the U.S.
"On the nuclear weapons front, it seems clear that the North Koreans are eager to get as much mileage out of their promise to shut down and dismantle the two facilities at Punggye-ri and Sohae as possible," said Revere. "It will be interesting to see what the U.S. is asked to give up in order to gain access." "We all agreed or understood that Punggye-ri was nearing the end of its shelf life," said Hill. "I would like to see some progress in terms of their acknowledging what they have and discuss plans for shutting those things down, rather than just choosing things on their own." Gary Samore, the White House coordinator for arms control and weapons of mass destruction during the Barack Obama administration, however, believes Washington and Pyongyang moving toward the second summit indicates that "progress was made" at the Pompeo's meeting with Kim. David Albright, a former U.N. nuclear inspector and current nuclear proliferation analyst at the Institute for Science and International Security, a Washington NGO that informs the public about science and policy issues affecting global security, said allowing inspectors at the North Korea's key nuclear testing site could be "a major breakthrough" that might reveal crucial clues to what types of nuclear weapons North Korea possesses and how many there are. "The United States would love to be able to do testing and sampling at the test site where it would be able to tell whether the weapons were plutonium or weapons-grade uranium or both," said Albright. "The goal from [the inspectors'] point of view would be to sample the radioactive debris left over from the tests and then, secondarily, to know that the test tunnels are totally destroyed as advertised by the North Koreans," said Albright. Stephen Biegun, the U.S. special representative for North Korea who accompanied Pompeo to Pyongyang, is slated to meet with North Korean Vice Foreign Minister Choe Son Hui soon to further discuss North Korea's denuclearization and Trump's summit with Kim. Ham Ji-ha and Ahn So-young contributed to this report, which originated with VOA's Korean service.